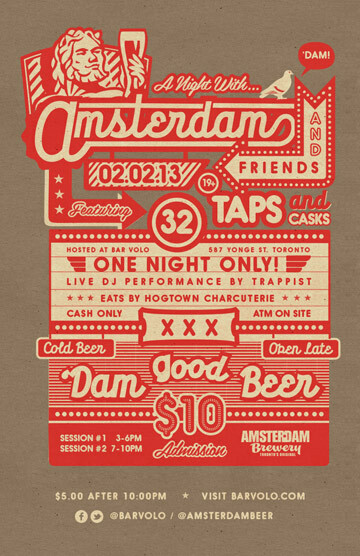 On Saturday February 2, 2013, for one night only, The Amsterdam Brewing Company takes over barVolo (587 Yonge St.) with 26 unique taps and 6 different casks in an event dubbed ‘A Night With… Amsterdam and Friends’. Tickets will be sold online at http://guestli.st/144039 beginning at 11am on Wednesday January 16, 2013 for two sessions. The first will take place from 3pm-6pm and the second from 7pm-10pm. Tickets will be $10.20 each (includes admission, tax and online processing fee) and will include 1 beer token, a commemorative sampling glass and limited edition booklet. After 10pm there will be a $5 cover charge for non-ticket holders. Hogtown Charcuterie will be providing food for the evening and DJ Trappist will be spinning 10pm-close. · Event is CASH ONLY, with ATM available. 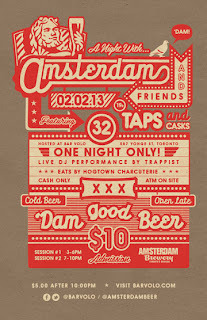 · Only Amsterdam beer will be served on this night. · Additional beer tokens can be purchased for $4.00 at the event. · BarVolo will not be open for regular business on Feb 2 due to this event. · Beers will be available by the ¼ (1 token) and 1/2 (2 tokens) pint serving sizes. 1. Sleeping Giant Barley Wine, collaboration with Biergotter. 2. Bastogne D'Or, Golden Ale with Brett Brux and Styrian Goldings, collaboration with House Ales. 3. Full City Tempest, Imperial stout with full city roast coffee. 4. Rip and Run Imperial Smoked Porter, brewed with wine skins, collaboration with House Ales. 5. Divination #2, Framboise with wild yeast harvested from Burgundy grapes. 6. Satyr Farmhouse, Farmhouse Ale with Lactobacillus and Brett. 7. Boxer Saison, Saison with Brett Brux and Lambicus. 8. Domestic Disturbance, 100% Brett Brux fermented ale with Pinot Noir wine skins in secondary, collaboration with Erica Graholm. 9. Alt, Traditional Dusseldorf Alt. 10. Second Coming, Stout aged in Southbrook Merlot barrels, collaboration with Biergotter. 11. Ezra (Solera #2), Farmhouse Ale aged in a Spirit Tree cider Barrel, collaboration with Great Lakes. 12. Barrel aged Tempest, Imperial Stout aged in fresh Jack Daniels barrels. 13. Vicar's Vice, Old Ale on cask. 14. Jump the Shark, American Strong Ale, collaboration with Indie Ale House. 15. Dead Spadina Monkey, Raspberry Sour aged in Thirty Bench Chardonnay barrels, collaboration with Indie Ale House. 16. Spring Bock, aged one year. 17. Wee Heavy, Scotch Ale aged on bourbon soaked oak. 18. Burned Bridges Porter, Brown Porter with peppercorns aged on oak chips used in Tawse Pinot primary fermentation, collaboration with Bridgid Young. 19. Left of the Dial Mild, on cask, collaboration with House Ales. 20. KLB Pale Ale, English Bitter, dry hopped with fuggles, on cask. 21. Downtown Brown, English Brown Ale dry hopped with Goldings, on cask. 22. Boneshaker, dry hopped with Amarillo, on cask. 23. Early Spring Saison, with lemon peel and peppercorns. 24. Lady Stavoren Wheat Wine, 50% wheat and 80 IBUs. 25. Long Goodbye Nitro IPA, collaboration with Swansea Homebrew Club. 26. Under the Table Double Belgian IPA, Collaboration with House Ales and Great Lakes. 28. Raspberry Gose, aged in Flat Rock Pinot Noir barrels, collaboration with Great Lakes. 29. Order and Chaos, Wit aged in fresh biodynamic Southbrook Chardonnay barrels. 30. Rye Peppercorn Saison aged in Cab Franc barrels. 31. Decalogue (1), 100% Brett Brux Trois barrel fermented Golden Ale. 32. Kyrie Tripel, aged in fresh Flat Rock Pinot Noir barrels.